Nintendo has updated the North American Nintendo Labo website with a lengthy FAQ. Four different categories are covered – “Basics”, “Make”, “Play”, and “Discover”. The FAQ does hold some very interesting information. Nintendo goes over box and Toy-Con sizes, the durability of the cardboard, replacement parts, and a whole lot more. You can read the FAQ in full below. 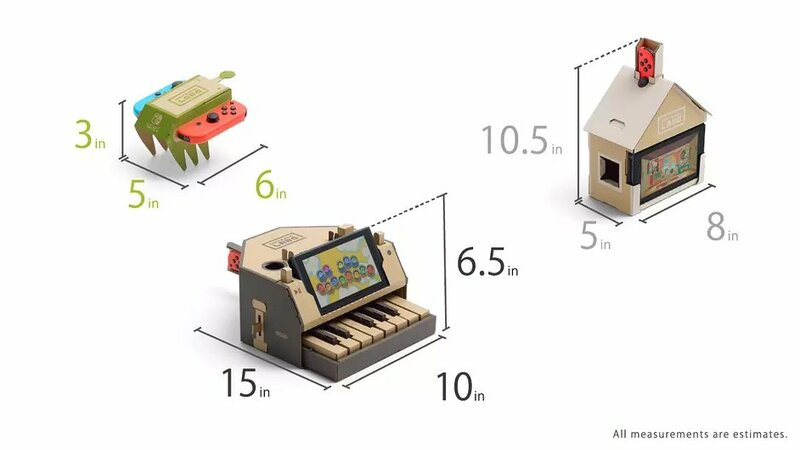 How big are the Nintendo Labo kit boxes? What about the Toy-Con projects? 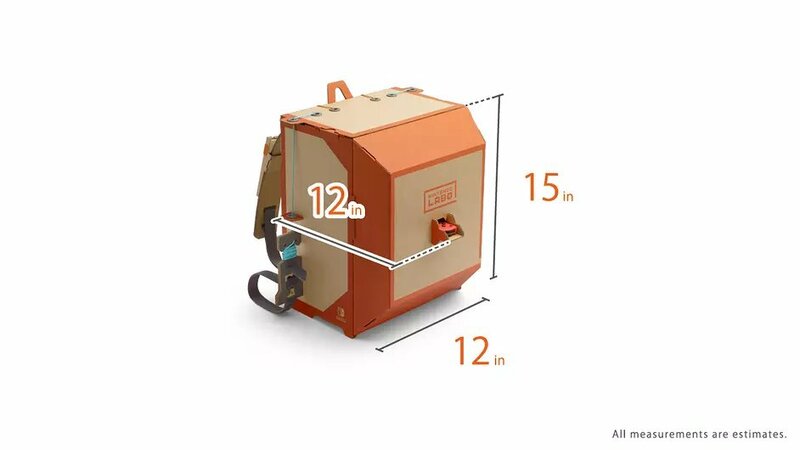 The box for the Variety Kit is 17.7 x 13.6 x 2.6 inches, and the one for the Robot Kit is 17.7 x 13.6 x 2.9 inches. We took some pictures of the finished Toy-Con creations so you can get a sense of their size. Check them out. Some Toy-Con projects include accessory parts, as well, like the knobs for the Toy-Con Piano and tools for the Toy-Con Robot. Here are some convenient ways to organize these parts and other Toy-Con projects. Organizing them this way makes it easy to store all your completed Variety Kit Toy-Con in one place. The Robot Kit includes a hook on the back, so you can hang it on the wall. 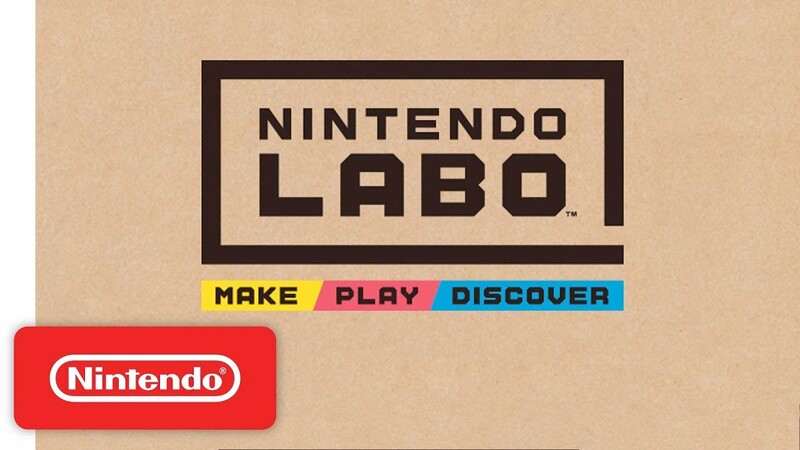 Where can I buy Nintendo Labo kits? Can I buy replacement cardboard parts? 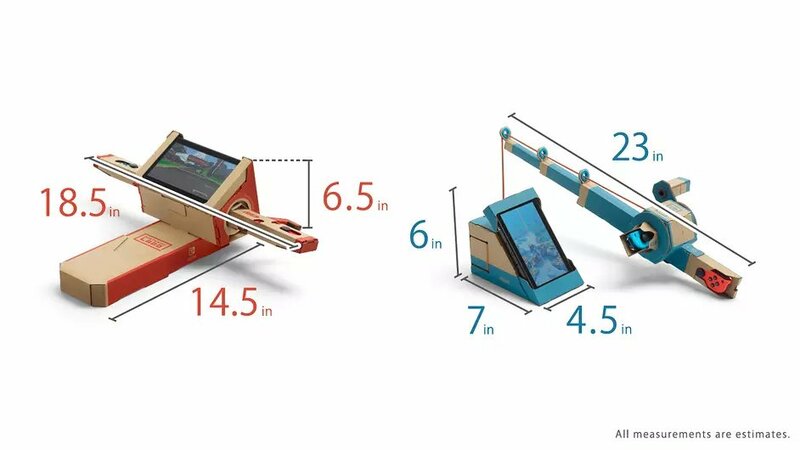 Most major retailers that sell video games will offer Nintendo Labo kits. You can order online from your favorite online retailers or check with your local retail stores. All the parts and software included in each Nintendo Labo kit are made to work together, so they’re always sold together. But if you need replacement materials, you’ll be able to purchase them starting April 20, 2018, at http://store.nintendo.com or by calling Nintendo Consumer Service at 1-800-255-3700. Some of the Toy-Con projects look pretty complicated. Will I be able to make them correctly? Don’t worry. Each kit includes interactive, step-by-step instructions for the Toy-Con creations in that kit on the included software cartridge. These instructions are easily accessible on the Nintendo Switch system (sold separately) and let you zoom in on a picture of the piece you’re building, view it from different angles, and go back if you want to check something again. And remember, it’s also fun to build things together with your older siblings, parents, or friends! Pre-folding means creasing the fold before you assemble the Toy-Con project. This makes the angles and folds sharper so they fit together better, which results in a better-looking finished project. When folding larger or longer parts, it helps to go back over the crease using more pressure. This gives you a cleaner line. The interactive instructions will point out how and where to pre-fold. What do I need to make these Toy-Con projects? All you need is a Nintendo Switch system (sold separately) and Nintendo Labo kit, which includes the engineered cardboard sheets, accessories, and Nintendo Labo software for that kit. No tools are necessary to build Toy-Con projects. Simply pop the pieces out… And put the parts together. What if I mess up a step or two? If your Toy-Con project isn’t turning out quite right, don’t panic. You can rewind the on-screen instructions and rotate the shape on the screen to match what you see, then go forward from there. You may need to carefully redo a fold to get yourself back on track. And you can always ask a parent or friend for help! What if I push a little too hard and rip the cardboard? Since Toy-Con creations are made of cardboard, repairs can often be made with common household materials like tape and glue. You can use colorful masking tape to fix and decorate your creation at the same time. Also, we recommend that you keep your cardboard sheets, even after the pieces have been removed from them. That way you can use the empty spaces created by the removed parts to trace and cut out spare parts from extra cardboard. Finally, if you need replacement materials, you’ll be able to purchase them starting April 20, 2018, at http://store.nintendo.com or by calling Nintendo Consumer Service at 1-800-255-3700. What age range is this appropriate for? How long does it take to make these projects? The challenge level should be just right for grade-school kids, but younger kids can join in on the fun with help from parents or older siblings. We expect to see fans of all ages trying these experiences. The time it takes to build a Toy-Con project varies based on its complexity and the skill of the builder. Some Toy-Con projects may only take 10-20 minutes, while others could take several hours. During longer builds, users can easily take a break between steps, then come back another time to continue. At Nintendo Labo Studio events, where children from first to sixth grade participated in making Toy-Con projects, many participants were able to fully enjoy making and playing with Toy-Con projects.